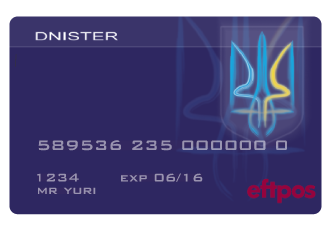 eftpos and ATM - Dnister Ukrainian Credit Co-operative. Access your funds at an ATM or eftpos with a Dnister Cuecard. Link your Cuecard to a transactional account such as the Everyday Access, Pensioner Savings or Community Access. Download an application form and gain more access to your funds! Find your nearest ATM wherever you are. View our fees and charges along with a list of the available free services. Want to know more? Contact our friendly Member Services Team. Your Cuecard is not limited to ATM withdrawals. Use your Cuecard to make purchases and get cash out at retail outlets displaying the EFTPOS logo. Keep your PIN secure at all times. Failure to do so may increase your liability for loss. General Advice Warning: In providing you with this information, you should consider the appropriateness of this product or service with regard to your particular financial situation and needs. We advise that you carefully read our Product Disclosure Statement and associated Disclosure Documents before acquiring a product.